All transactions are safe and secure with a reliable history in online purchasing behind each of our associates. 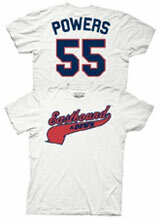 Buy the Eastbound and Down t-shirt to own Eastbound and Down clothing and merchandise. Eastbound and Down is quickly becoming one of HBO's funniest shows to date. Follow former pitching pro, Kenny Powers (Danny McBride), after he talks himself off of a handful of professional baseball teams. During his attempt to adjust to his new life, he strikes out with his former flame, April Buchanon (Katy Mixon). He also chaperones a middle school dance while being high with his friend Clegg (Ben Best). If you want to be "in", then be the first to grab one of these Eastbound and Down t-shirts and enlighten your friends about Kenny Powers' hysterical mishaps. In addition to the Eastbound and Down tee above, browse the Eastbound and Down Clothing Gallery for more apparel like men's and women's clothes, kids shirts or hoodies.